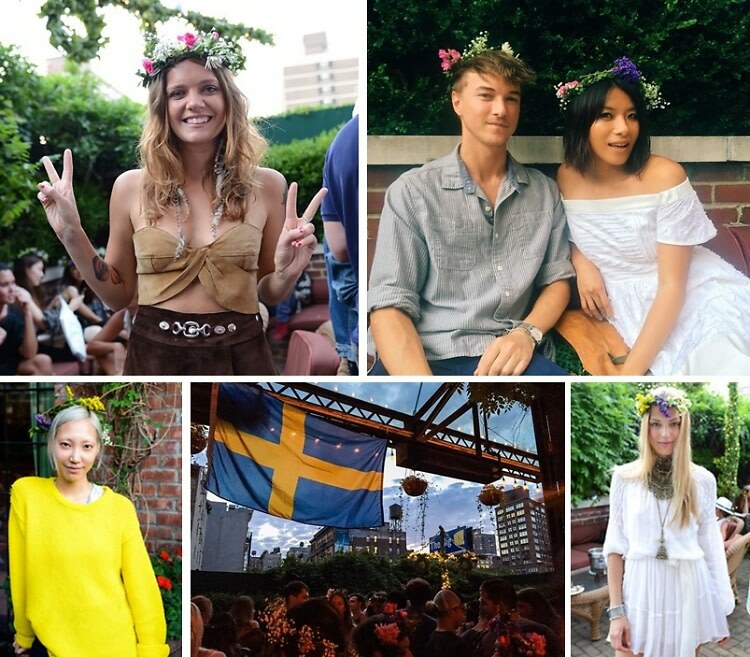 Swedish Midsummer in NYC is a strange thing...a vast majority of people have never heard of it, yet for a certain few it's one of the most fun celebrations of the season, on par with Cinco De Mayo or the 4th of July. Battery Park is where the biggest crowd shows up, but we opted for NYCult's annual Midsommarfest held at the Bowery Hotel terrace, where our favorite fashion and nightlife people donned their best flower crowns for a marathon dance party that's an early candidate for best party of the summer. The event usually takes place at B Bar, but the move across the street was simultaneously more intimate and more crowded, with so many guests but so few strangers. Tommy Saleh, Travis Bass, and Johnny Christ enlisted a bevy of hosts and DJs to bring in their stylish friends, with everyone just a few degrees separated from each other. The event started with most of the guests lounging outside and taking in the sun, but as dusk approached crowds formed on the dancefloor, rocking out to the sounds of Spiky Phil, Mans Ericsson, and Saleh himself. Danish band Hess Is More also played a live set right in the middle of the room, for an audience that included Tove Lo, Alana Zimmer, and even famed photographer Mario Testino. Swedish food was served by Brown and Green Catering, and there were even socks given out by the colorful brand Happy Socks. Between the sea of Scandinavian beauties, the exuberant crowd, and the perfect setting, the bar is set pretty high for the rest of the summer. Who was there: Guests included Tommy Saleh, Travis Bass, Johnny Christ, Vance Brooking, Amanda Norgaard, Cici Walerud, William Vitello, Lotta Kvarnung, Geordon Nicol, Spiky Phil, Elle Dee, Mans Ericsson, Edda Petursdottir, Hess Is More, Matthew Rowean, Magnus Berger, Michael Bruno, Cecile Winckler, May Kwok, Vassili Di Napoli, Matthew Green, Abel Daniel, Chloe Caillet, Mariella Everett, Eric Goode, Mario Testino, Tove Lo, Alana Zimmer, Teddy Perweiler, Dexter Love, Alex Jiang, Francesca Vuillemon, Jorge Balerzo, and Jasmine Poulton.